Over the last three weeks, as the world has watched the spectacle of the Zuccotti Park protesters in lower Manhattan, some have been inspired and, in many cases, repulsed at the protesters occupying the park. Since the protests have now garnered the backing from the professional protesters from the AFL-CIO‘s 56 unions and the SEIU, as well as implicit and explicit support from the Obama Administration and Democrats, there is more relevance to examining not just what the protesters are protesting but what they are promoting. Meet “the Collaborators” [aka Baklava [sic] Boy and his friend. It was a chance encounter (the taking of this picture and the subsequent conversation) on Day One of #OccupyWallSt that gave some insight into the minds of the Neo-Communists protesting across the country. 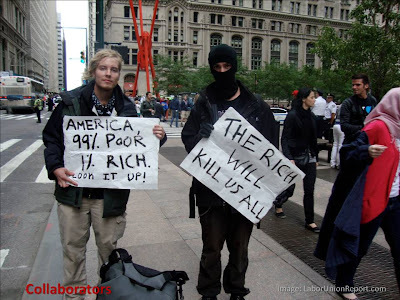 Since most observers know that the #OccupyWallSt protesters are protesting capitalism and free-markets (generally), as well as banks and “corporatism” (specifically), other than a general destruction of America’s economic system, there has been a lot of questions as to what protesters’ end goals are. As the #OccupyWallSt protests have been designed and populated by a hybrid of hard-core Marxists, from the leftist unions, to socialists and actual Communists, there have the stated goals ranging from the seizure of workplaces, schools and the “de-privatization of everything,” to the AFL-CIO’s more “moderate” goal of a worldwide tax on financial transactions. Then, there is also the unofficial proposed list of demands that has drawn a good deal of ridicule.